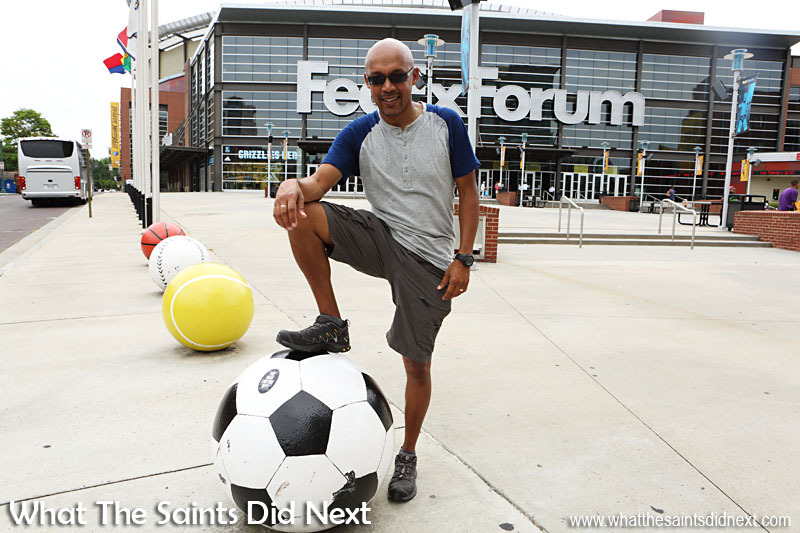 One day to visit Memphis, walking into Beale Street. 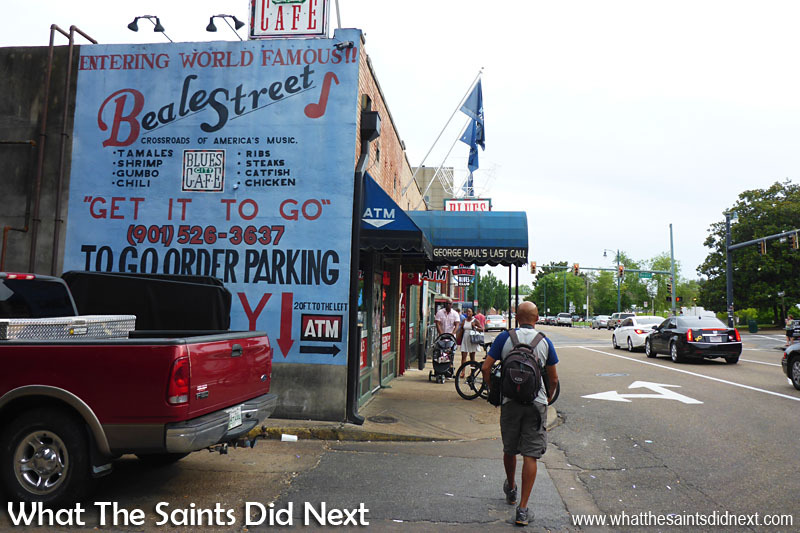 Blues music reaches out from the Beale Street restaurants and follows us along the sidewalk. Under this sweltering summer weather in Memphis, we’ve explored the river front earlier this morning. 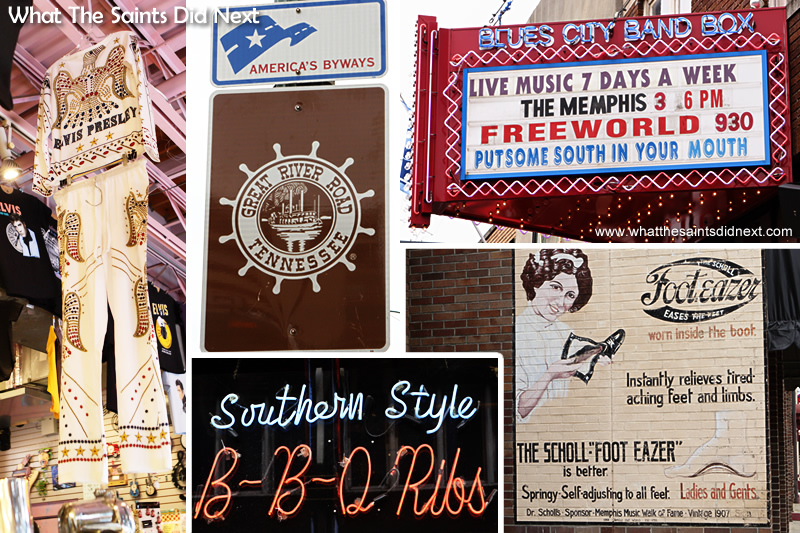 With only one day to visit Memphis we’ve got to see the city’s most famous street. Google’s Beale Street map has pinned the Fedex Forum Memphis and A Schwab Memphis as nearby points of interest. Reps stationed outside the Beale Street clubs make half-hearted attempts to lure us inside, but they can see, I’m sure, from our ‘glowing’ state, we’re not exactly fitting the day drinker profile. To be honest, ice-cream would really get our attention right now. 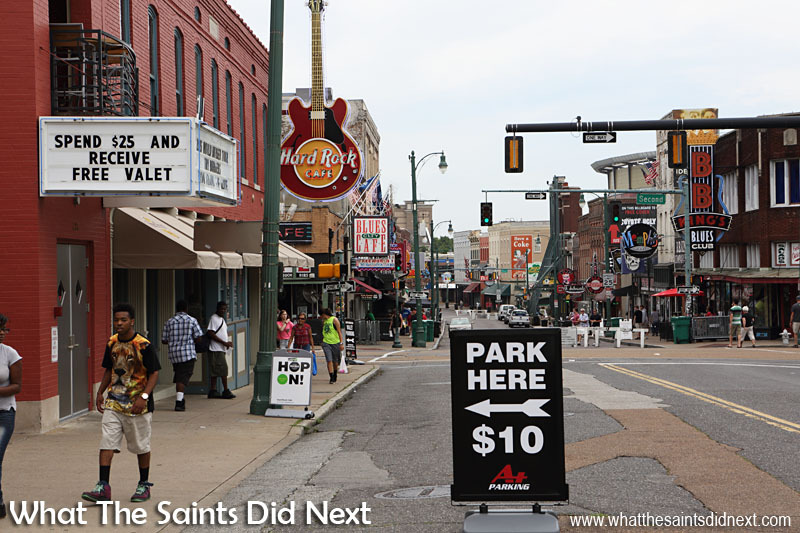 So here we are on Beale Street in Memphis Tennessee, often referred to as the ‘home of the blues.’ Here we find people; pedestrians – not a lot, but better than the empty streets thus far today. The population in Memphis Tennessee is around 654,000, but most of the people we can see I’m guessing are out-of-town tourists. Beale Street bars and restaurants line both sides of the street with a smattering of souvenir shops thrown in for good measure. Even though the street is closed to traffic most people are sticking to the pavements like us. Can’t break the habit. This is Beale Street, Memphis. 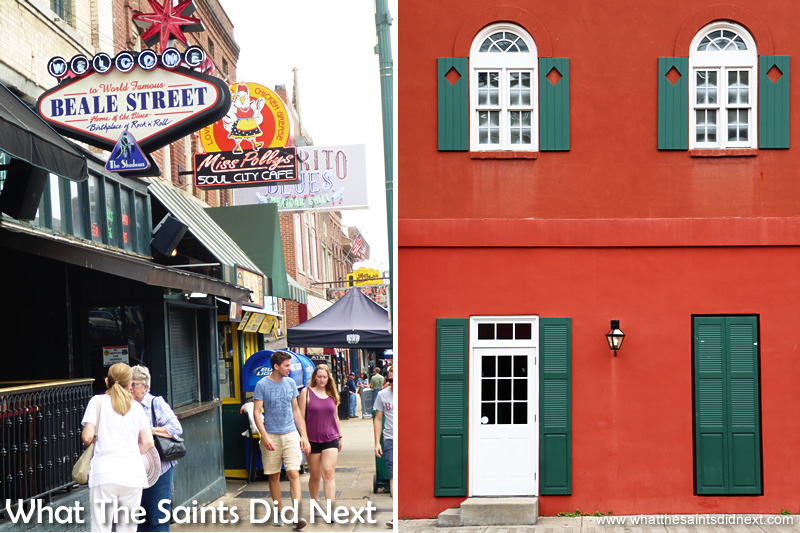 The contrasting styles of Beale Street. Elvis Presley Memphis memorabilia is everywhere, but you could also spend a lot of time just reading all the signage along Beale Street. 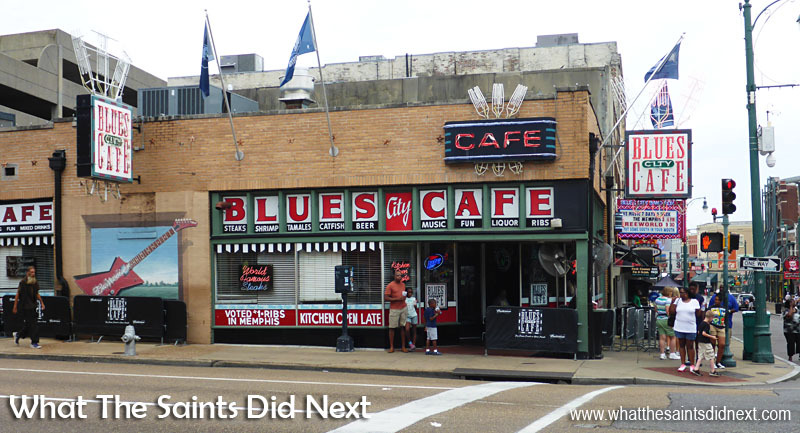 Beale Street restaurants offer plenty of places to eat and listen to the blues. 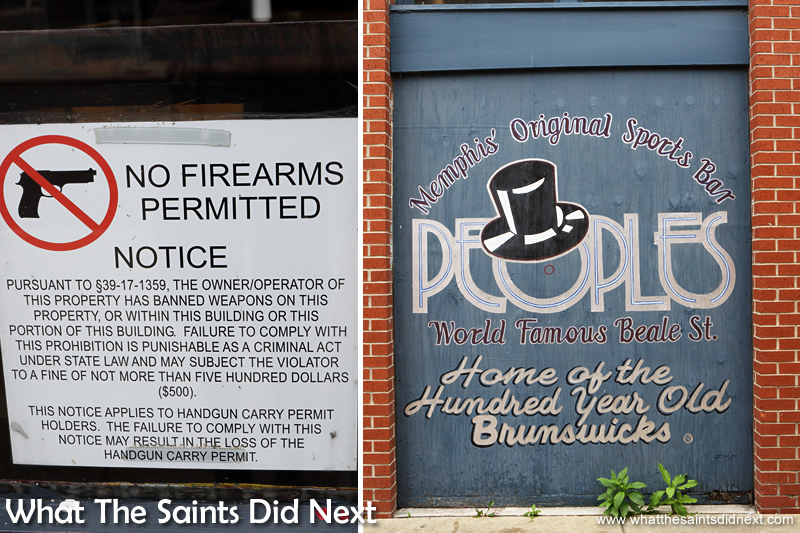 One day to visit Memphis – Colourful murals are brilliant, but it still feels strange seeing ‘No Firearms’ signs on shops. 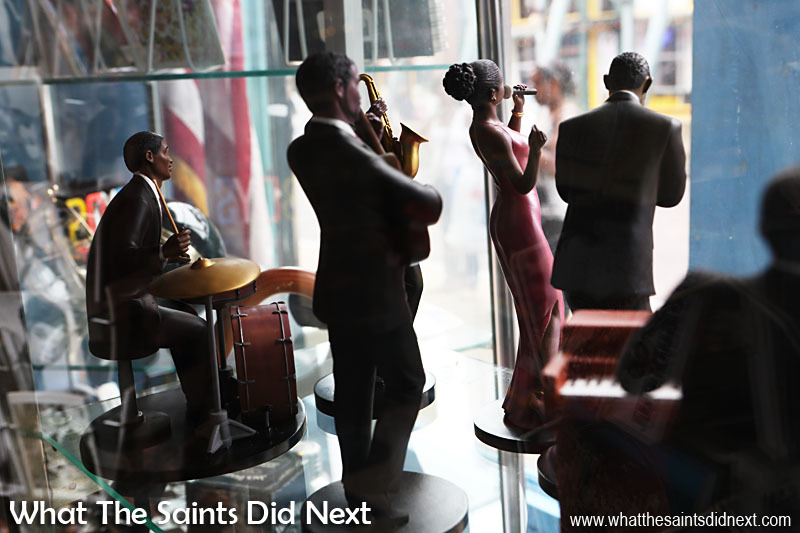 Beale Street souvenirs, Memphis, Tennessee. 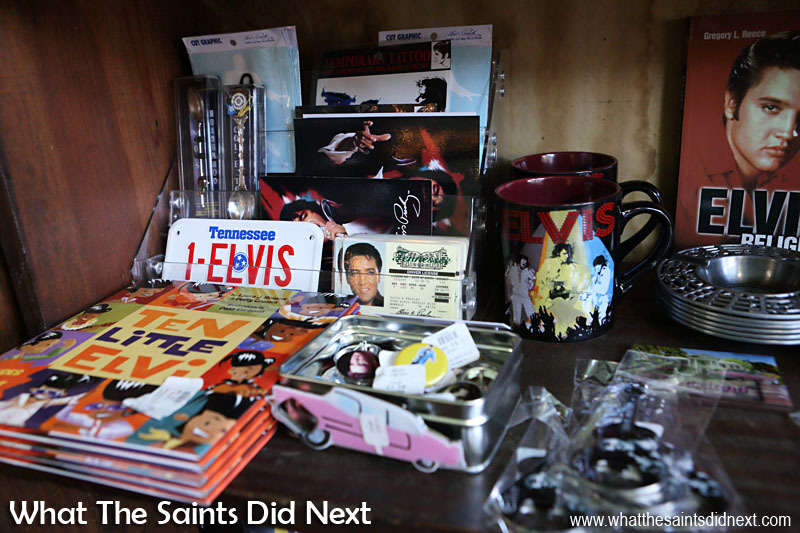 For anyone souvenir shopping in Memphis, the outlets are full of BB King merchandise, blues music trinkets and of course plenty of Elvis memorabilia including a classic, white jump suit decorated with sequins. Hmmm! I suppose it could be more appealing to people now that the onesie is in style! After browsing a few of the shops we are soon at the far end of the street. Around a corner is the giant FedEx Forum arena, home of city’s professional basketball team, the ‘Grizzlies.’ Out of curiosity we wander over to have a look but the female security guard on the door isn’t in a good mood and seems irritated to have a couple of tourists asking what’s inside. “No, you cannot go inside,” is her curt response to my best smile and request to enter! Oh well, let’s move on (and work on that smile). We are both in need of a coffee. After trying three cafe/bars who declare they don’t sell coffee, we give up on attempts to support a localised business and head back to a Starbucks we saw earlier. Good old Starbucks. Perked up with caffeine we wander back along Beale Street to visit the A Schwab Memphis. It’s half museum, half shop. 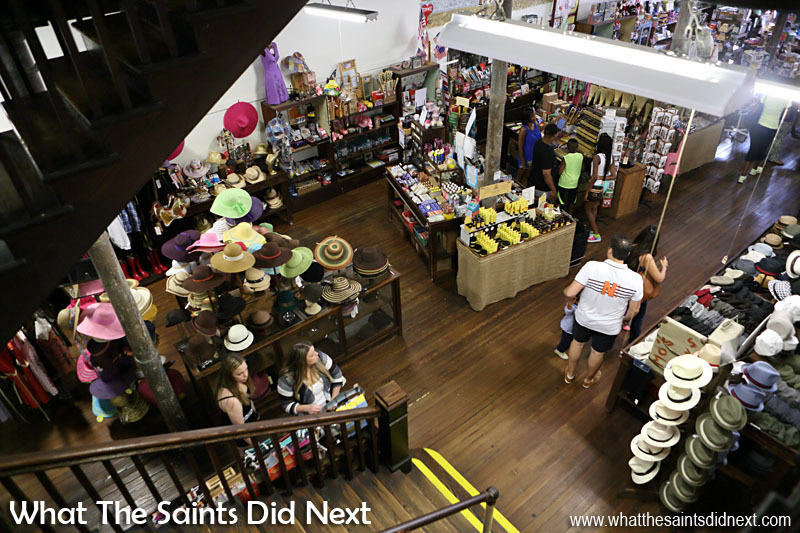 The ground floor is a souvenir shop bursting with music themed souvenirs, unusual bargains and cool novelty items. The wooden peg guns that fire rubber bands are tempting, but I resist suspecting it can only lead to tears later – the road trip is going well so far! 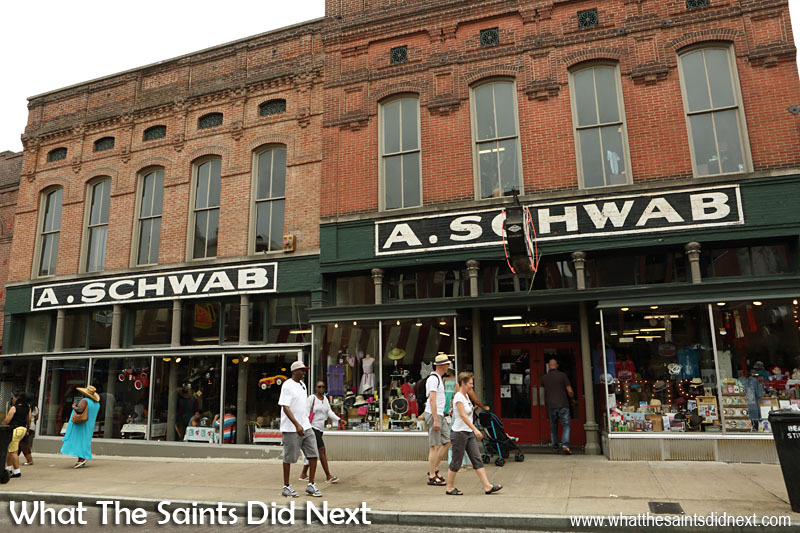 A Schwab Memphis, the museum on Beale Street, a great place to visit. Free entry. Inside the A Schwab Museum on Beale Street in Memphis. 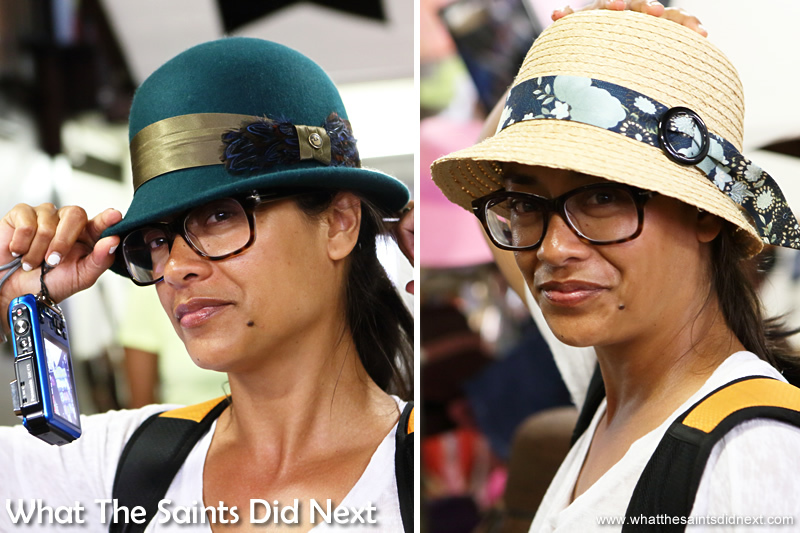 All the hats were just too tempting for Sharon. Mini fashion show in session! Up the stairs is an American museum, wonderfully informal yet full of intriguing historic exhibits from not that long ago. 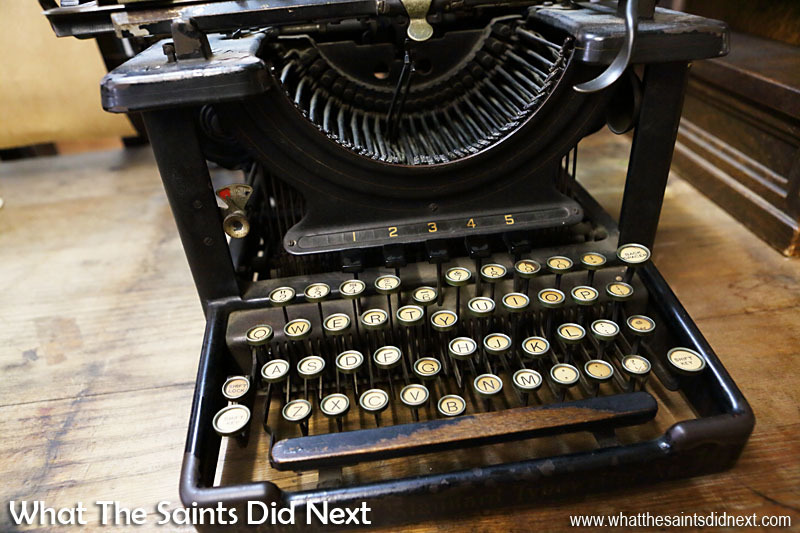 Early typewriters with big heavy keys; 45rpm vinyl records in classic paper sleeves; a very mechanical looking laundry wringer thingy; a wooden cased cash register and many more fascinating items. There’s a real chilled vibe about this place and the staff throughout the building are extremely friendly and helpful. Best of all it’s all free to visit. The laptop’s great, great grandfather. 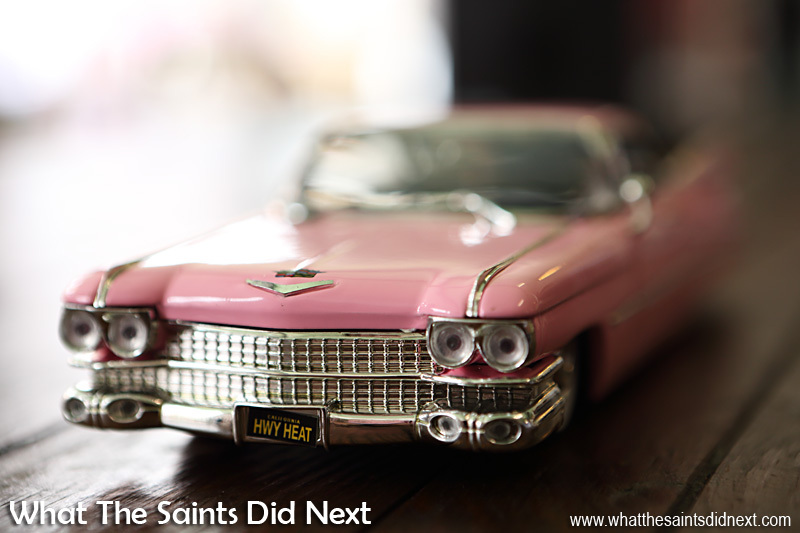 Rock and roll in Memphis, Tennessee. Downstairs the museum has its own ice cream bar and we decide to treat ourselves as a way of showing support to such a brilliant venue. It’s probably one of the best ice creams I’ve ever had. Awesome. I would definitely recommend the A Schwab Museum for anyone planning to visit Memphis. Soon after 4pm we set off for the nearby Peabody Hotel to see the famous Peabody Ducks. On the way, walking along Second Street it’s noticeable the appearance of lone men loitering on the corners and in doorways. After the seeing the ducks, we return to Beale Street for dinner to find there are plenty more men hanging around. We are stopped and asked for money as are other people who are out walking. It’s not a total surprise as I’d read about this earlier in online reviews. The Philly Po sandwich it said on the menu came with chips, which we found out meant Lay’s crisps, not French fries! 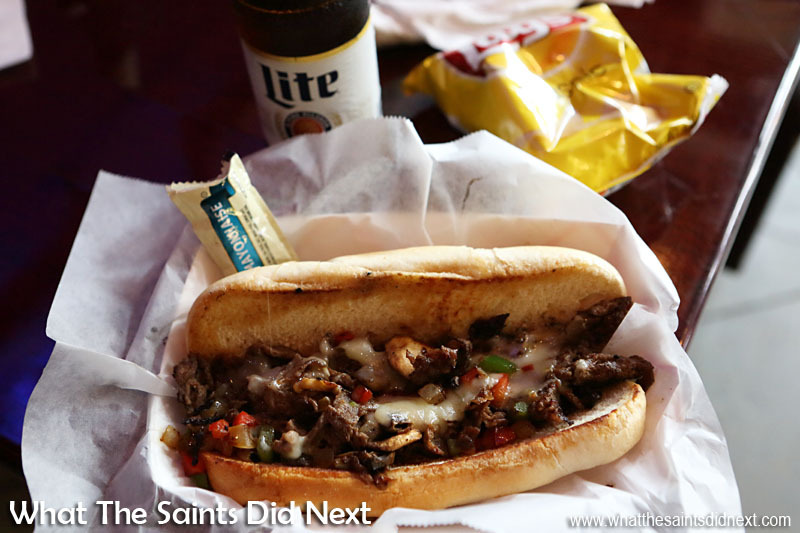 On Beale Street we both opt for a Philly Po sandwich at one of the cafes, helped down with a Miller Lite each. The presentation and service is, sadly, poor, and although the bar has wi-fi we are told the owner isn’t there to provide the key. They don’t appear too happy when we pay our bill with exact change. To use up some time we wander along Main Street where trams, or trolleys as they’re called, are operating. It’s a truly beautiful street bursting with greenery, very photogenic. Sadly, the restaurants and cafes are all virtually empty which gives the place a bit of spooky feel. 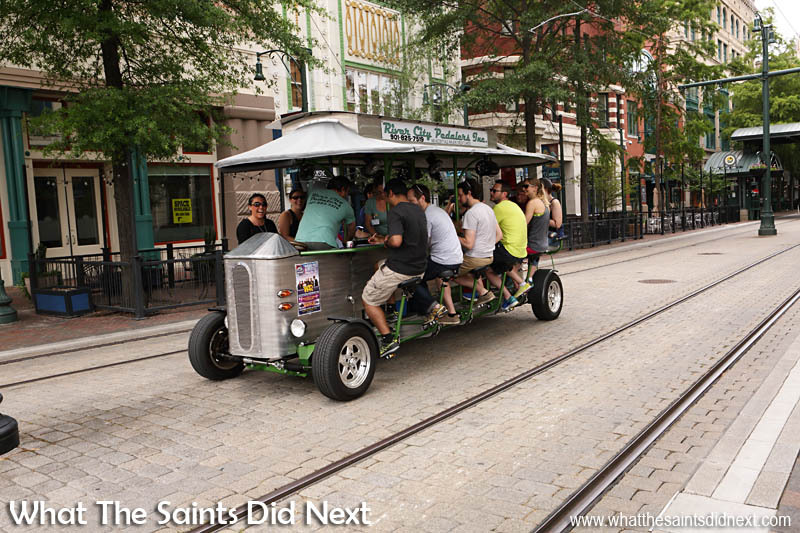 One day to visit Memphis – A cycle bar making its way along Main Street. 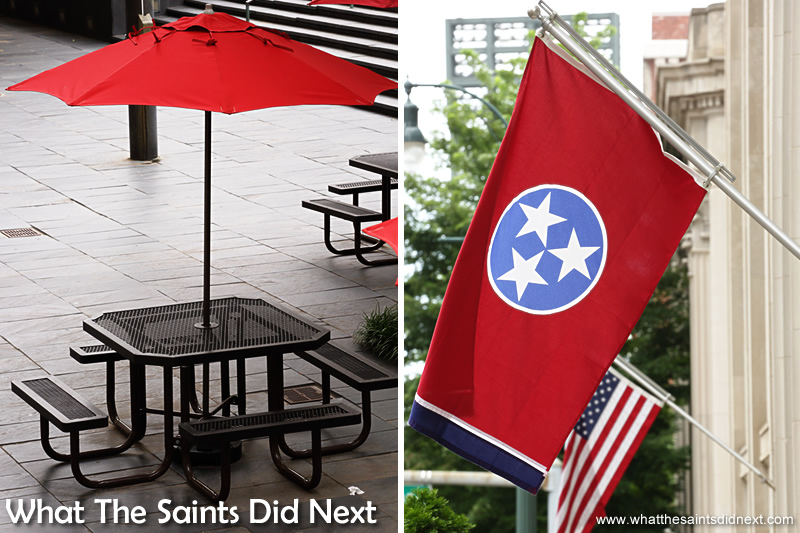 The photogenic Main Street in Memphis and the Tennessee state flag. Returning to the deserted car park on Monroe Street, ours is the only car left on the ground floor. As we approach, a loiterer crossing the street spots us coming and stops, waiting on the corner. Suddenly another couple appear from an alley and the man is distracted. As we scoot by we overhear an elaborate pitch for money. Feeling safe in the car we drive down to the riverfront and the floodwall gangway from earlier this morning. 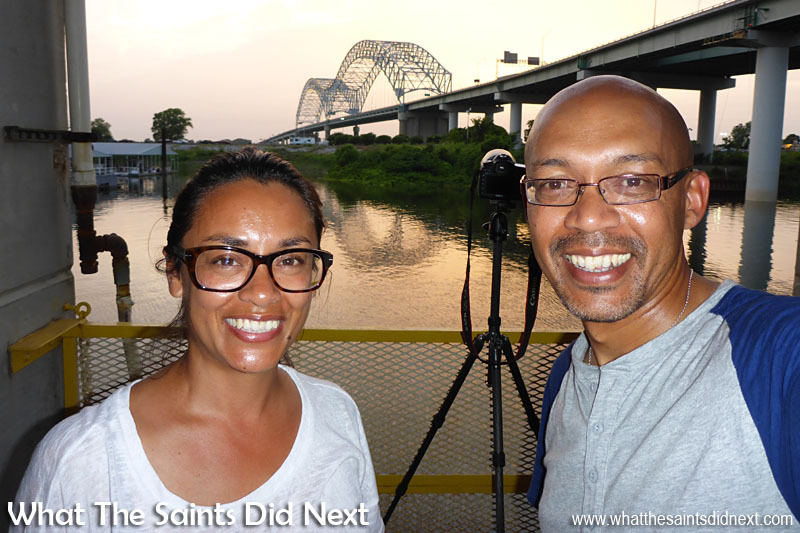 We wait around until dark to shoot the Hernando De Soto Bridge in Memphis. By now the area is completely deserted as the nearby Bass Pro store is closed. A group of teenagers suddenly appear on the walkway behind us giving us a right fright, but they turn out to be very friendly and just out to view the bridge at night like us. 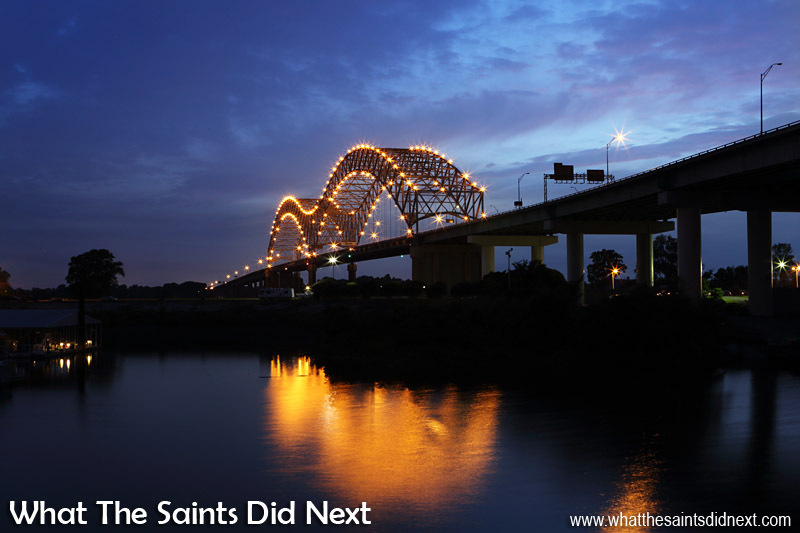 The Hernando De Soto Bridge in Memphis Tennessee is named for 16th century Spanish explorer who travelled this stretch of the Mississippi River, and died south of Memphis. 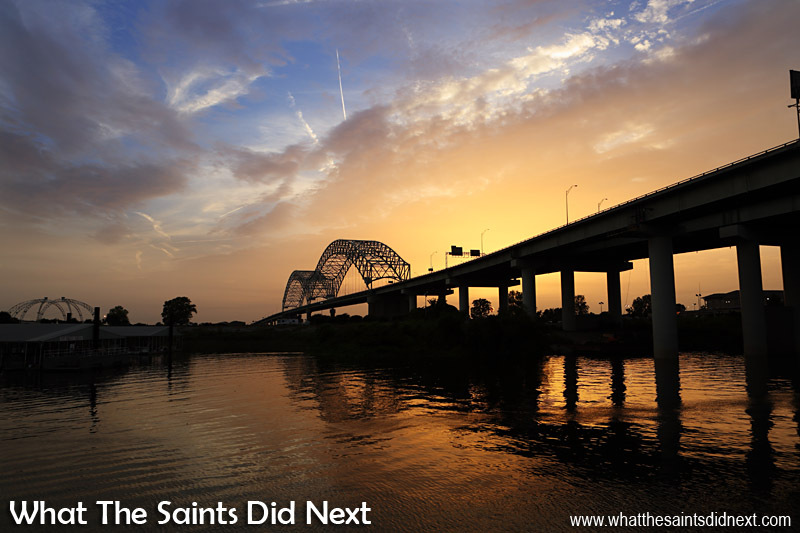 The Hernando De Soto Bridge in Memphis opened in 1973 and carries more than 55,000 vehicles each day. It is referred to as the “M” Bridge because the arches resemble the letter M.
Many Memphians call it the “New Bridge” simply because it’s newer than the Memphis-Arkansas Bridge. At night, the bridge is illuminated by 200 sodium vapour lights along its “M” structure. The big “M” on the bridge has become a symbol of the city. The Hernando De Soto Bridge in Memphis. Photographing the Hernando De Soto bridge in Memphis at sunset, in Tennessee. It’s been a long day. 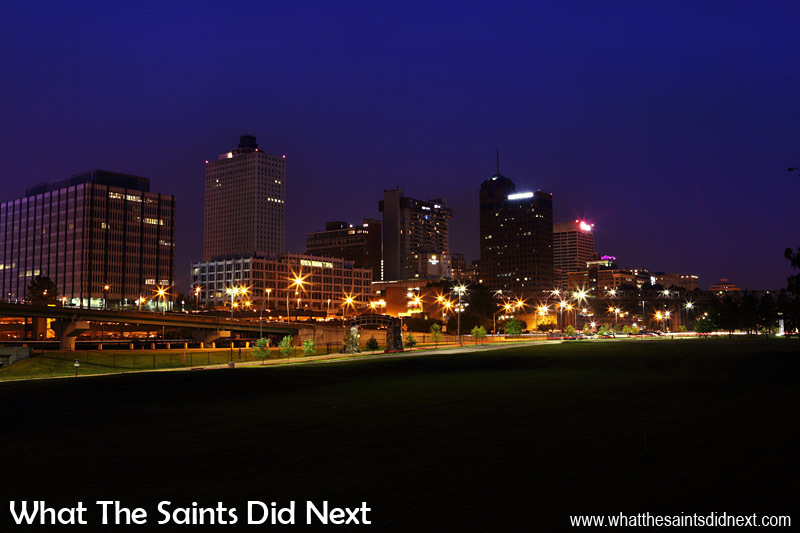 Memphis, Tennessee at night. Looking back toward the city from the top of the floodwall. A little after 9pm, photography complete, we head back to the motel. We’ve been out walking the streets of Memphis for well over 12 hours and in desperate need of a shower. Pyramids, marching ducks and Philly Po sandwiches; we only had a day to visit Memphis, Tennessee but it’s been a great experience. The Hernando De Soto Bridge is illuminated by 200 sodium vapour lights along its “M” structure.